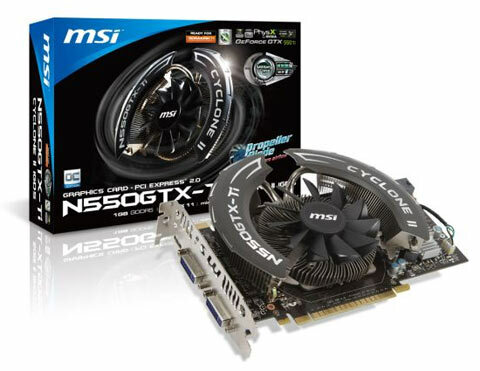 Facebook Friday: MSI GeForce GTX 550 Ti Video card! Welcome to our 15th straight weekly giveaway here on our fan page! We love our fans and our sponsors! You guys love Facebook Friday right? Every Friday we announce a product that we will be giving away on Monday morning. We try to keep the weekends light around here, so this will give our fans something to talk about over the weekend. Legit Reviews has always striven to be a simple site and we are going to keep this contest simple also. To enter just share this note on your personal wall, like it and comment why you want to have the MSI GeForce GTX 550-Ti Cyclone II video card here on the post. If your post is deleted you no longer have an entry in the contest and it is likely due to the fact that you spammed the wall with something or didn't follow the instructions above. We will be holding the drawing on Monday morning, where we will pick a name at random and announce the winner. Yes, it is just that simple. Remember, if you don't share the note you won't be able to win. If your wall is private we'll add you as a friend and if you didn't share the post then we'll have to pick a new name. MSI will ship the video card to the winner and is willing to ship the prize bundle to any address in North America! If you live in a country outside the North America maybe you can ship the board to a friend or family member located in North America and then have them ship it to your country. As always you will be responsible for any customs fees, taxes or any other charge associated with your local rules and regulations. This contest is also void and null in locations that do not allow such things to take place. We always get people upset that it's not open to other countries, but please remember we are located in the US and are working with US companies to get the prizes. Be sure to check out the MSI site by following the link given above to give them some love for donating a great video card for our followers! By helping spread the word about this contest you'll help us keep these promotions alive. So be sure to share and help us out! We love giving stuff away, but need your help! Please also feel free to post this on your own site/blog as that is okay! Remember to post why you want the MSI N550GTX-Ti Cyclone II 1GD5/OC video card this week! Re: Facebook Friday: MSI GeForce GTX 550 Ti Video card! I want it! Don't want Facebook though. I am building a new system soon and could use this card to finish it off. Third time is a charm it seems. The first and second winners did not claim the prize but the third did. Congrats to him. It might be a good idea to mention that private messages on Facebook may be found in Messages/Other if the person is not following you. I understand the "tool" that Facebook provides. I have to say that I liked the old forum drawings better. At least there you had to have a certain amount of posts and were registered with the website. I bet that at least half of the Facebook entries have never even visited the site before. Major_A wrote: I understand the "tool" that Facebook provides. I have to say that I liked the old forum drawings better. At least there you had to have a certain amount of posts and were registered with the website. I bet that at least half of the Facebook entries have never even visited the site before. LOL, there's been a drawing every week since it started, seems it's been good for all involved except maybe Apop, a pita for him!! I know you guys hate the facebook contests, but in all honesty social media sites are growing and in a sense forums are dying. I see a point for forums, but they are becoming more niche as most new sites are even using social networks for the commenting sections for news and articles. Facebook does play a very significant role in the traffic to the site. In recent months it has become the #2 source for traffic to the site. For example look at my Google Analytics data for the main site (not the forums). Facebook has become the #2 incoming site when it comes to sources of traffic. Yes, that means they are sending more traffic than Bing, Yahoo and any other site or blog that links to us on a daily basis. My job is to grow the site and to get the reviews and news that the LR staff writes out to as many people as possible and Facebook has been one of the best ways to do that. Facebook is bringing in a decent chunk of traffic and there is solid growth there. i like the facebook contest.. well its better than no contest - I just always forget to check the friday contest until monday morning when I get back to work!